Around the world in 40 years . . . Part 14. On opposite coasts | A balanced diet . . .
Steph and I first visited San Francisco in July 1979, en route from Costa Rica (where I was working for the International Potato Center, CIP) to a potato conference in Vancouver, Canada. Then, less than two years later, in March 1981, we were in New York for just a couple of nights. We had passed through JFK in 1975, but not stopped over. Yes, a potato conference in Vancouver. The 63rd annual meeting of the Potato Association of America where I was to present some of my research on the control of a bacterial disease of potatoes¹. We were taking advantage of CIP’s spouse travel policy for Steph to accompany me, as did our 15 month old daughter, Hannah. In 1979 there were no direct flights to San Francisco from Costa Rica; that still appears to be the situation today. The most direct routing was via Guatemala City to Los Angeles on Pan Am, and then a ‘local’ connection on to San Francisco. Pan Am used Guatemala City as their Central America regional hub in the 1970s. As we lived in Turrialba, about 86 km west of San José’s Juan Santamaria Airport, we must have left for the airport in the early hours to catch the morning flight. It was a bit of a hassle in Los Angeles, going through immigration and customs, and transferring terminals. Thankfully, Hannah was mostly a good flier and, as I recall, we had an uneventful journey. I’d made a hotel reservation in the center of San Francisco, but had wanted to stay at another, the Hotel Beresford on Sutter Street close by Union Square. In those days there was no online booking, of course. So, it wasn’t until we arrived in San Francisco that we discovered the Beresford was just a couple of blocks away, and so transferred the next day. My parents had stayed there when they visited San Francisco on their once-in-a-lifetime post-retirement trip to the USA in 1976. I think my elder brother Ed had also stayed at the Beresford when he was doing part of his PhD research in the San Francisco area. It came highly recommended, and we certainly felt more comfortable there than our first hotel. So. You’re in San Francisco for the first time. What do you do, remembering, of course, that anything we planned had to take into account the eating and sleeping needs of a small child? Wandering around the Union Square district we opted for a Gray Line bus tour of the city, taking in a crossing of the Golden Gate Bridge into Marin County among other sights. Otherwise, we wandered around on foot, or took a taxi to specific places we thought would be interesting. And of course there was the requisite tour of the bay around Alcatraz Island and its former penitentiary, a wander around Fisherman’s Wharf, and dinner on Pier 39. On the bay boat trip . . .
Too soon, our short visit to SF was over and we headed north to Vancouver, the next leg of a journey that would take us also on a road trip from Vancouver to Edmonton, Alberta, a flight to Madison, Wisconsin and a side-trip to the USDA’s potato station in the northeast of Wisconsin at Sturgeon Bay, before returning to Costa Rica via Chicago O’Hare and Miami International. In March 1981 I resigned from CIP having accepted a lectureship at The University of Birmingham. Although we could have flown directly back to the UK, we planned to travel via New York. We held a bank account with Citibank in New York, and wanted to close that account, withdrawing our savings for transfer to the UK. That meant visiting the bank, completing all the necessary paperwork, then walking out of the bank with a bank draft. It’s remarkable how smoothly everything went. I’d obviously advised the branch president (manager) of my visit. In those days it was still possible to have personal contact with someone in the bank, and she told me to ask for her when I arrived at the branch. I headed off to the bank first thing in the morning, and was waiting for. She had the forms ready for me to sign, and while she personally transacted the paperwork through the system, gave me several cups of coffee while I waited. After about 45 minutes, I guess, she came back with the cheque, and I went away several thousands of dollars to the better. That left the rest of the morning and afternoon for sight-seeing, fulfilling two ambitions: a trip to the top of the Empire State Building and a walk round Macy’s. Sight-seeing with Hannah was easier than two years earlier. She was now almost three and seemed to take everything in her stride. I’m not sure how we came to choose our hotel, on Park Avenue or close by. Maybe the travel office at CIP in Lima had made the booking for us. The name ‘Loew’s Drake’ comes to mind. But from what I can find through a Google search, that hotel ‘The Drake’ would have been beyond my means. Who knows? We arrived late to New York on a Lufthansa DC-10 flight from Peru, and went straight to bed. The second night we decided to dine in-house. You can imagine my consternation when I sat down and the maitre d’ placed a jacket on the back of my chair. I hadn’t complied with an implicit (but not obvious) dress code, by not wearing a jacket of my own or a tie. Deaorting for the UK, we took a British Airways flight from JFK to London Heathrow, occupying a row of three seats (window, middle and aisle), with Hannah in between Steph and me. We must have been about 20 minutes into the flight when I heard a British gentleman in the row in front mutter, rather loudly, to his wife that he hoped the little girl behind wouldn’t bother him throughout the flight. I hadn’t noticed until then that Hannah was sitting with her legs out straight, pushing against the back of this man’s seat. I told her to stop immediately, and she didn’t do it again for the rest of the flight. Anyway, I got out of my seat (I was on the aisle) and moved round to face this man, and explained that I hadn’t noticed what Hannah was up to, it would stop henceforth, and I apologised profusely for the inconvenience. You can imagine how gobsmacked I was when he refused my apology. So I just returned to my seat, somewhat nonplussed. One of the cabin crew had seen this unfold, and as she passed, discreetly encouraged Hannah to continue pushing the seat. We had a good laugh at that. I’ve been back to New York on at least one more occasion since, in the early noughties. 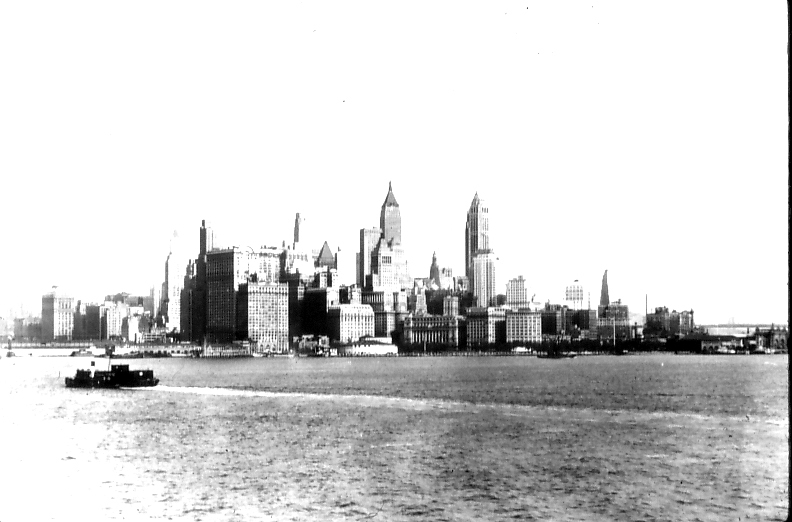 It’s a city I’d like to return to and explore more, maybe arriving there on the Queen Mary 2, sailing under the Verrazon-Narrows Bridge, past the Statue of Liberty, and taking in the iconic Manhattan skyline, just as my father did in the 1930s as a ship’s photographer for the Cunard White Star Line. My mother trained as an orthopedic nurse in New Jersey across the river from New York, and watched the Empire State Building being erected in 1930/31. Stories about New York were part of my childhood years. ¹ Jackson, M.T. & L.C. González, 1979. Persistence of Pseudomonas solanacearum in an inceptisol in Costa Rica. Am. Potato J. 56, 467 (abst.). Paper presented at the 63rd Annual meeting of the Potato Association of America, Vancouver, British Columbia, July 22-27, 1979. This entry was posted in Musings from the past, Out and about, Travel and tagged New York, San Francisco, USA.